Scroll down for the latest on efforts to combat algae and protect our drinking water. Click here to read the label on Algimycin algaecide. Click here for Frequently Asked Questions about the most recent algaecide application. Click here for a profile of Dr. John Rodgers Jr. of Clemson University, an expert overseeing our algae management innovation and research. Click here to read Clemson University's recent article about Dr. John Rodgers Jr. and his global experience with algaecides in safe ecosystem management. Click here to send us an email and be added to our mailing list for the Healthy Lakes newsletter and periodic Lake Alerts. Click here to read and download the entire library of Healthy Lakes newsletters, including the most recent edition, which you can find by clicking here. And, while you're at it, click here to review our Water Quality Reports, which contain lots of information about our drinking water. OUR WATERSHED—Spartanburg Water’s efforts to reduce the presence of taste-and-odor-causing algae byproducts in its reservoirs are following the experts’ prescription of a familiar medicine: Algimycin, an environmentally friendly algaecide whose key ingredient is copper, a standard element in best-practice approaches to algae removal. 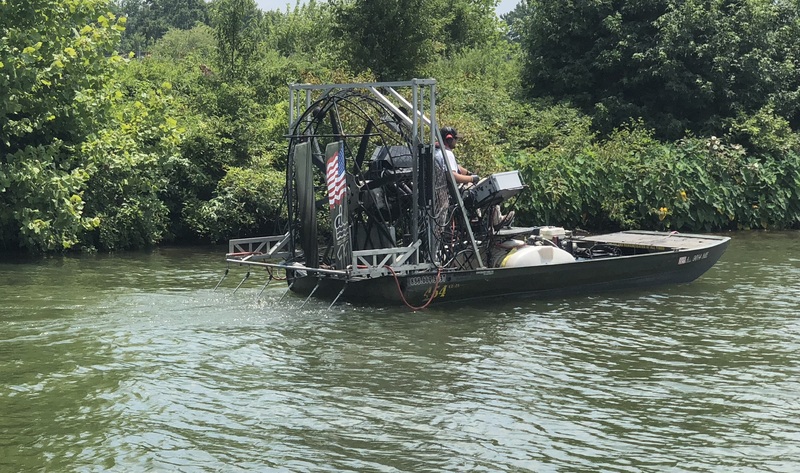 The algaecide application was administered by trained professionals on Lake Bowen earlier this month, and was also applied to portions of Municipal Reservoir Number 1 on Friday, July 27. Preliminary results indicate that the most recent treatments were successful. The company performing the applications, Aqua Services Inc., has done the same work for multiple utilities across the U.S., including the Tennessee Valley Authority, Georgia Power, Mississippi Power and U.S. Steel, among others. Click here to read more about Aqua Services Inc.
Algimycin, which has been certified by the National Sanitation Foundation as a safe treatment for use in drinking water resources like Lake Bowen, is viewed by the experts as among the best options for combating MIB, or Methylisoborneol. That’s why Dr. John Rodgers Jr., a professor and director of the Ecotoxicology Program at the Clemson College of Agriculture, Forestry and Life Sciences, prescribed a specifically calculated dose of Algimycin to reduce the presence of MIB this month on both Lake Bowen and Municipal Reservoir Number 1. It’s a product that is familiar to many on the utility’s water quality team: Rodgers first prescribed Algimycin in 2015, when MIB spikes began occurring that summer. Dr. Rodgers said, for example, that algae growing in a little less than 15 percent of Lake Bowen that were producing taste-and-odor compounds were treated with about 190 parts per billion of Algimycin. But is it safe? Click here to read Dr. Rodger’s academic profile and see a list of his research articles. But, like any other medicine, Dr. Rogers said, it must be administered by a trained professional. Following a significant fish loss on both reservoirs following an algaecide application to treat Geosmin, a different algae byproduct in May, Dr. Rodgers has been working with a multidisciplinary team to determine the best methods to not only fight the effects of algae, but also ensure the safety of fish in the ecosystem. A different algaecide, Current, was used in the May application. Dr. Rodgers said a number of environmental factors were likely the cause of fish loss—not a single and limited application of algaecide. Click here to read Dr. Rodgers’ findings following a detailed study of fish recovered from the lake in May. Click here to read the label on Current algaecide. Although fish loss is a known potential side effect of algaecide use, products like Algimycin and Current are recognized as best practices in the safe reduction of taste-and-odor causing algae byproducts when prescribed by experts like Dr. Rodgers and managed by trained and licensed applicators. 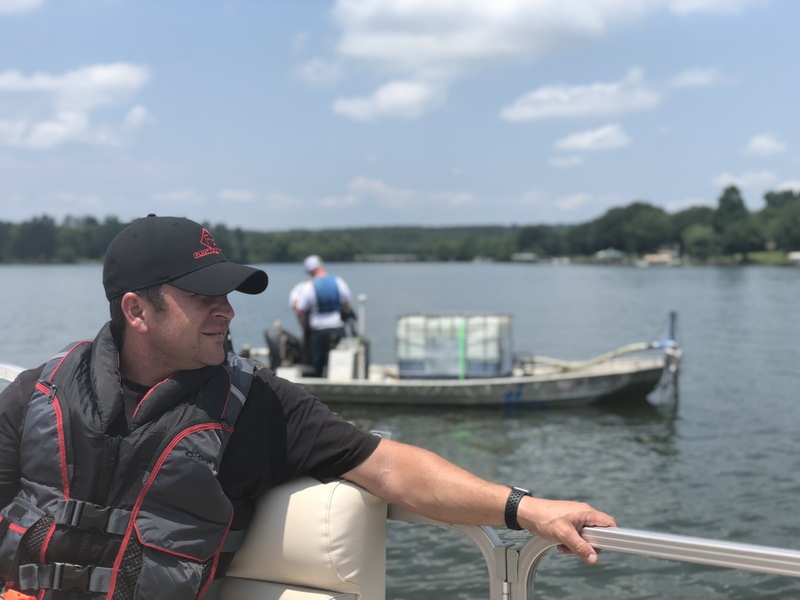 In fact, Aqua Services Inc., whose team has performed all of Spartanburg Water's algaecide applications since 2015, counts world-renowned bass fisherman Bill Dance among its many clients. 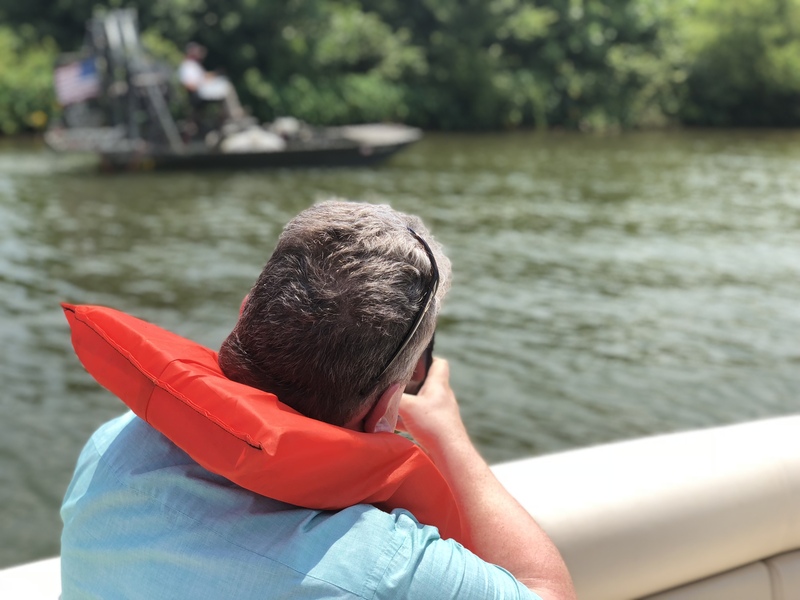 Click here to read an article about Bass Fisherman Bill Dance's work with Aqua Services, Inc.
Water quality and safety are the number one factors in determining the best algae-reduction methods, said Ken Tuck, Director of Water Treatment. Tuck said that the application was successful in protecting our community's drinking water source from certain algae that may cause taste-and-odor concerns. Dr. Rodgers said that the challenges associated with ecosystem balance—and lake management—are not unique to Spartanburg Water. Recent reports of algae blooms have underscored the importance of studying the underlying causes for the frequency with which they’re occurring across the country. Email us at healthylakes@spartanburgwater.org to learn more. ABOUT SPARTANBURG WATER: Spartanburg Water is comprised of Spartanburg Water System and Spartanburg Sanitary Sewer District. It serves a population of nearly 200,000 within Spartanburg County, as well as others in parts of Greenville, Union and Cherokee counties. With the help of its dedicated team of more than 250 employees, each day it produces an average of 25 million gallons of drinking water and cleans 12 million gallons of reclaimed water for its customers and community. It is one of only 60 water and sewer providers around the globe to be recognized by its industry peers as a “Utility of the Future Today,” which highlights excellence in operational practices, community engagement and environmental stewardship. ABOUT THE CLEMSON COLLEGE OF AGRICULTURE, FORESTRY AND LIFE SCIENCES (CAFLS): The College of Agriculture, Forestry and Life Sciences at Clemson University curriculum explores plant, animal, human, molecular and packaging sciences, and builds upon Clemson University’s world-class academic, research and extension activities to produce scientific discoveries of global significance and graduates prepared to be leaders in their chosen fields. CAFLS remains grounded in the fundamental principle that Clemson University is committed by its land-grant legacy to ensure that higher education remains a public good, and that land-grant colleges link their expertise to the needs of the people. ABOUT DR. JOHN RODGERS JR.: Dr. John Rodgers Jr. is a professor and director of the Ecotoxicology Program in the Forestry and Environmental Conservation Department at the Clemson College of Agriculture, Forestry and Life Sciences. He is an expert in water quality and ecosystem management issues who has authored or co-authored numerous research articles and travels around the globe helping communities manage environmental challenges. Dr. Rodgers received his Ph.D. in Biology and Aquatic Toxicology from Virginia Tech in 1977 and is a vice president and member of the board of directors of the Aquatic Plant Management Society.